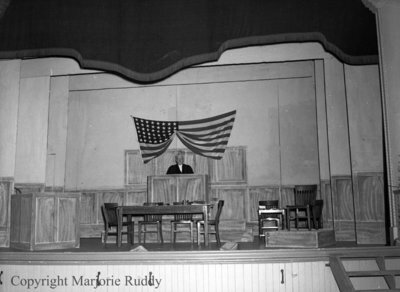 Black and white negative showing the stage at the Town Hall decorated with a courtroom set. The name of the play is unknown. There is a person sitting at the judge's bench. Town Hall Stage, 1950, Marjorie Ruddy, Whitby Archives, A2013_040_1624. Scanned black and white large format negative.